According to a press release from Emporio Armani, Rafael Nadal will personally reveal his new fall 2011 ad campaign on a twenty-foot-tall billboard at Macy's in Herald Square this Thursday. It'll be a jeans ad, which means he'll still be shirtless, but you won't need to feel self-conscious about gaping at it publicly (unlike this one, shown [the underwear shot where his hands are on his head]). We wish him success, but not Bieber-caliber success, for everyone's sake. 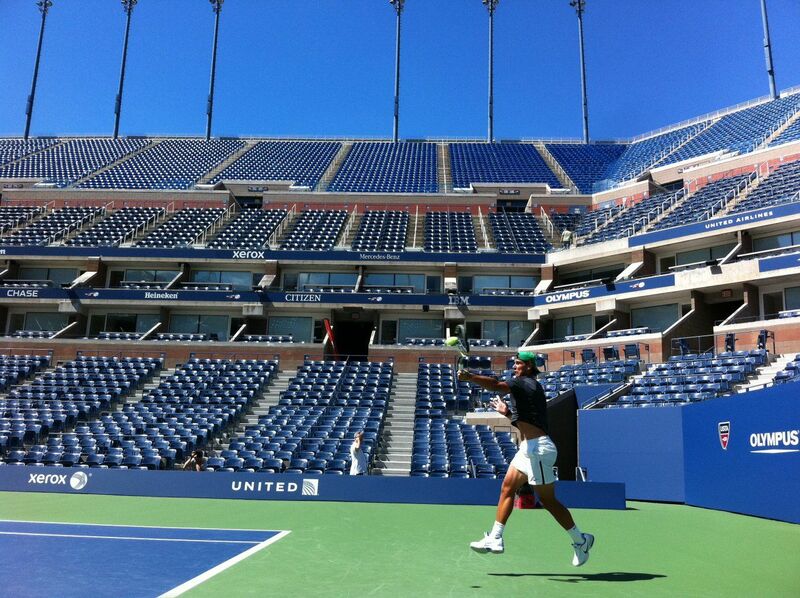 Rafa Updates his FB/Twitter with the first USOPEN practice Pic & his schedule for tomorrow's Bacardi event. First training at the @usopen 's Center Court! I have good feelings when I remember the last match at this Cuort!! Hi Guys! I will be at FoodParc (29th St and 6th Ave) tomorrow at 4PM- come support me as I am at an event for Bacardi Limited's Champions Drink Responsibly campaign.